In a stand mixer, fitted with a paddle attachment, add cream butter and stir. Scrape down sides of the bowl and add both sugars. Mix all together for about 3 minutes. Add the egg and vanilla and continue to mix. In a mixing bowl, sift together the flour, baking soda and salt. Then add the flour mixture to the sugar mixture and stir until just combined. Add the peanut butter and mix until well combined. Then roll heaping tablespoon sized balls with the dough. Toss in the egg whites followed by the potato chips, until well coated. Place balls onto a parchment-lined baking sheet and gently press your pinky into the centre of the dough. Place into the oven and bake for 12 to 15 minute or until cookies have spread and baked through. 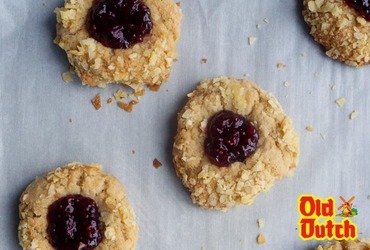 Allow cookies to cool completely before filling with a small amount of jam. Once cookies have been filled with jam, set aside and allow cookies to set, about 1 hour, then serve.